generate, support, promote, and deliver new relationships between land, people, economy and environment in Scotland". The original Group comprised Dr Alison Elliot, Professor Jim Hunter, a well-known writer on highland matters, and Dr Sarah Skerratt, a social geographer. In April 2013, the latter two were replaced by Dr John Watt OBE, Ian Cooke and Pip Tabor. A group of advisors included Robin Callander (of Birse, an expert on common and community land) and Bob Reid, an Aberdeen-based planner and one-time President of the Mountaineering Council of Scotland. Over autumn/winter 2012/13, 484 submissions were made, and 5 open meetings held (though none in the North-East). In May 2013, an Interim Report focussed attention on extending community land ownership beyond the North-West; "good practice"in "shared decision-making", a possible Land Agency, farm tenure, and public access. 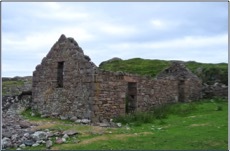 It also identified as "outstanding issues"the Crown Estate (which owns Glen Livet and 3 other estates, plus about half the Scottish foreshore), "common good land"owned by local authorities, land taxation and ownership succession. The Final Report, published in May 2014, has nine Parts (chapters) - Context, Ownership (general, public, local community); Development and Housing; Ownership and Use; Agricultural Holdings; Common Property Resources, and the Way Forward - and includes some 60 Recommendations. This article focusses on aspects likely to be of greatest interest to readers of Mountain Views, and offers some personal views at the end. Land reform in Scotland has featured in national discussion ever since the Forty-Five, and in physical terms, before - and occasionally after - that. In 1886, crofting was established as a special form of land tenure in seven counties (which excluded Aberdeenshire, Banffshire and Moray), and has attracted legislative reform several times since then. General agricultural tenure - usually involving farm landlord-tenant relationships - has also been a perennial problem. And economic problems - "sustainable development"in current policy jargon - in remoter areas have often been ascribed to the high concentration of private estate ownership in rural Scotland (432 private land owners are estimated to own half the private land), either directly through estate management practices, or indirectly through lack of suitable housing. "Third sector"land ownership, e.g. by the National Trust, the RSPB and the John Muir Trust, has grown, but usually with nature or heritage conservation as the main objective, rather than jobs and incomes which might retain the younger rural population. With the advent of a Scottish Government and Parliament in the late 1990s, land reform gained new momentum, and a Land Reform Policy Group reported in 1999-2000. There have been several subsequent Acts, including the Abolition of Feudal Tenure (under which only the monarch actually "owned"land) Act 2000, the Land Reform Act 2003 (which promoted community land ownership and established a "right to roam"responsibly), and the Wildlife and Natural Environment Act 2011. Currently, the House of Commons Committee on Scottish Affairs is conducting its own inquiry into land reform, and the Community Empowerment (Scotland) Bill recently introduced into the Scottish Parliament takes forward a number of ideas in the Review Group's Final Report (see below). A full Land Reform Bill is promised in 2015.
the management of land, e.g. in relation to deer, "hill tracks", etc. land ownership limitations and taxation. Key issues here are what (or who) constitutes a "community"("local" or otherwise), what sort of legal "body" can acquire, manage and develop land, and how this can be "assisted" (see remit above). Community land purchase in recent years has been patchy, with only about 20 such purchases now covering about 200,000 hectares (ha) out of the Scottish total area of some 7.9 million ha: the Government aims to double this area by 2020. The main difficulties seem to be: (a) landowner unwillingness to sell; (b) inability to raise the necessary funds; and (c) the complexities and pitfalls of the 2003 Act procedures. The Group recommends that the Government should be more "flexible" in terms of legal structures for "appropriate community bodies" eligible for support. It suggests easing the requirements for registration as a community body, and Minister-approved 'actual' ability to purchase at any time rather than having to wait 'pre-emptively' for a potential sale. The Community Empowerment Bill reflects some of this by defining "community planning partnerships" as well as "community-controlled" and "community participation" bodies which may be (suitably set-up) SCIOs, and might perhaps include non-human members such as a mountaineering club with a presence such as club hut in the area. Rather than a "substantial connection" with the relevant land as now, only a "connection" would be necessary. It also specifies that a "community" can be based on "geographical boundaries, common interests, or shared characteristics of its members". Finance (which was not in the Group's remit) seems likely to remain a major hurdle to community purchase of land: the Scottish Land Fund disburses about £2 million each year, but a single estate is likely to cost more than that, as with the recent £11 million (from an unknown buyer) paid for 12,000 ha at Auch near Bridge of Orchy. By comparison, Scottish farmers received some £533 million each year during 2007-13 under the Common Agricultural Policy, and there are substantial tax concessions to property ownership. Despite 21 Ministerial approvals for communities to purchase land under the 2003 Act, only 21,000 ha (mostly the Assynt Estate, according to the Group) have actually been bought, and it is likely that other opportunities have been missed due to the need to form and register an eligible community body, and to put together an adequate bid and ownership plan in the limited time available. The Group had rather little to say on this subject; it considered that its evidence, though "significant" in number of submissions, showed "little appetite for legislative change". Concerns - which included blocked access, damage by mountain bikes, and wild camping - could, it thought, mostly "be resolved by better implementation of the Access Code". It therefore simply recommends that Ministerial guidance (rather than the Code itself) should be "updated", presumably by SNH and the National Access Forum (which was not thought necessary to put on a statutory basis; the Forum is due for review by SNH anyway). This guidance could include the greater use of dispute resolution mechanisms such as arbitration to fill the gap between Access Officers and Local Access Forums, and the (expensive) Courts. The Group also proposes that current "archaic" common-law rights over public access to foreshore, inland water and seabed should be replaced by rights "integrated" with those of the 2003 Land Reform Act: this might assist access to sea-cliff climbing, and canoeing. The Group was clearly unhappy with the current position as regards Scotland's water resources. Much recent legislation has established "public interest" as the main consideration in freshwater management and use, but ownership of river and loch beds remains with the adjacent owners. The Group recommends that these riparian rights be "reviewed and reformed", so that the beds would be "treated as part of the same public domain" as the water itself. Wild fishing has been subject to similar debate but legislation (much of which discriminates between salmon as ultimately a Crown possession separable from other ownerships, and other wild fish) has not yet been much revised, except as regards the conservation of endangered species. The Group proposes that District Salmon Fishery Boards (a longstanding and important landowner-based administrative and interest group) be abolished, in favour of "a new improved statutory framework to ensure the sustainable management of Scotland's wild freshwater fish populations in the public interest", and "a clear policy framework and associated arrangements to deliver improved opportunities for members of the public to fish for wild freshwater fish in Scotland"
As regards deer management, the Group was "struck during its own investigations by the limited progress in addressing some of the issues over the management of wild deer in Scotland, particularly red deer, despite many years of debate over these issues". The great increase in forested area (in lowland as well as mountain areas) has led to both more deer of all species, and increased pressures to cull - the majority of the annual cull is now in woodlands, much of it by Forestry Commission Scotland. Its Final Report does not mention conflicts between deer stalking (or other hill sports such as grouse shooting) and hillwalkers or mountaineers, but rather focusses on "environmental damage to habitats, economic damage to crops and the social costs which can result from deer-vehicle collisions". In line with recent changes in water management, the Group proposes that "improvements should be made to the current statutory framework governing the hunting of deer in Scotland to ensure [that] appropriate culls are carried out to adequately safeguard public interests", e.g. by requiring owners to apply for consent to cull (with SNH taking over if a landowner "chooses not to meet the standards required for sustainable deer management in the public interest"), and setting clearer public-interest standards while culling. This might include issues of access to the hills. Management of grouse moors (an important land use in the NEMT's home region) is treated almost entirely in terms of the questionable environmental aspects of muirburn, and the awkward tensions for both private and public sectors between the economics of forestry and those of grouse shooting (which has a capital value of some £5,000 per brace). The Group "anticipates" that the Government's emerging Land Use Strategy will have to try to resolve some of these conflicts by reducing landowners'flexibility in how they use their land. Perhaps the most radical of the Group's recommendations relate to limiting the area in any one ownership, and to land taxation. As regards the former, the Final Report specifically mentions Deeside, where about 95% of the land area (of about 155,000 ha, or 2% of Scotland's total area) is owned by 20-odd owners with over 400 ha each. "The Group considers that concentrated patterns of private land ownership in localities like Deeside inhibit the development of the rural communities in these areas". It recommends that "the Scottish Government should develop proposals to establish ... an upper limit on the total amount of land in Scotland that can be held by a private land owner or single beneficial interest". It does not suggest any particular limit (or perhaps limits, or ratios? ), but considers that it is important to establish the principle of such a limitation, in pursuit of "a greater diversity of land ownership"(see remit), and sustainable development. Would such a limit affect "third-sector" owners such as the NTS, RSPB and JMT, who own 78,000, 54,100 and 24,461ha respectively in Scotland? These areas compare with the largest private ownerships (mostly trusts) such as the estates of Buccleuch (106,000 ha), Atholl (59,000 ha), Invercauld (49,000 ha including Torloisk on Mull), Seafield (40,900 ha) and Westminster (38,500 ha) (all 1995 estimates), and so might be caught by an upper limit of say 10,000 ha. However, the problem could be overcome by ensuring that third-sector owners have sufficient "public interest" or "common good" conditions (see below) in their constitutions, or agree appropriate management with a Government authority. The main public-sector rural ownerships - the National Forest (651,000 ha), Government-owned crofts (95,200 ha), SNH (35,700 ha), the Crown Estate (35,500 ha), and Scottish Water (24,300 ha) - would presumably be exempt from any limit imposed for "public interest" reasons, since Ministers have direct control. In the chapter on Owners of Land, it is suggested that it be "incompetent for any legal entity not registered in a member state of the European Union to register title to land in the Land Register of Scotland". This would not prevent ownership by non-EU interests, but would improve transparency of ownership, which is roundly criticised elsewhere in the report, with several recommendations on improving land registration (less than 30 per cent of titles in rural areas are recorded in the Land Register). Similarly, in the Agriculture chapter, an upper limit is suggested for payments under the Common Agricultural Policy. Potentially even more radical - because it would affect a larger number of landowners, and others - is the Group's proposal that the current exemptions of most land-based businesses from non-domestic rates should be "reviewed", as having "no clear public interest". 'Sporting rates' on fisheries and shoots are specifically mentioned, and could be "tailored to each of the species involved" in ways that would help to deliver the Land Use Strategy, though precisely how is not explained. Finally, Land Value Taxation - based on the land itself rather than the properties upon it - is proposed as deserving of a "detailed study", whose philosophy and evidence would no doubt spark widespread debate! The Land Reform Review Group operated under the remit that "greater diversity" of landownership would improve people's "stake" in community development, and "deliver new relationships between land, people, economy and environment in Scotland". Having identified some current problems, such as lack of housing for local people, and excessive deer numbers and muirburn, its report focusses on legal and institutional recommendations which it hopes will improve the "common good [which] describes a comprehensive and complex concept which brings into its embrace questions of social justice, human rights, democracy, citizenship, stewardship and economic development". This is done largely by inserting or strengthening a requirement in policy operation to address the "public interest", which it accepts is "politically identified at any one point in time". One's attitude to the Group's work can therefore be based on either or both of two issues. Firstly, how should the various components of the "common good" concept be pursued? - clearly a basic political/philosophical area concerned with private rights and state powers. At its heart, this involves questions of "fairness", between those with "too much" (land or wealth), and those with "too little" (income, housing, etc.). And what policy instruments to "improve" the balance will be efficient without reducing welfare too much (or at all)? Secondly, will the Group's recommendations, if carried out, actually do much to bring about economic "improvements", apart from greater "fairness"? The Group seems to have accepted without quibble or further analysis that greater landowner diversity, and especially "community" landownership, would improve economic development. Landowner-sponsored surveys suggest significant current streams of local income and employment dependent on "unprofitable" estates. However, there are regular allegations (e.g. in the Cabrach) of rural development "blight" due to large (and small) estate management. Reliable evidence is hard to find. And there is the inevitable conflict - though sometimes denied or underplayed, and certainly not addressed in the Group's report - between economic development and environmental conservation, especially in remote and "wild" areas such as the hills. Under Scottish legislation, even National Parks must "promote sustainable economic and social development" as well as natural and cultural heritage, and in other areas the Scottish Government's overriding "purpose" of "increasing sustainable economic growth" shows which way the balance now lies. Only in the area of grouse moor management does the Group's report address the environment directly (mainly in terms of atmospheric pollution and downstream water management). Several issues of primary concern to mountaineers - such as hill tracks and wind farms - are largely neglected. As indicated above, the Scottish Government has already taken steps to implement some of the Group's recommendations on community land management, though the practical effects seem likely to be very limited for extensive estates. Other recommendations, such as those relating to land taxation, have so far received a negative response from the Government, perhaps because the Independence Referendum has discouraged domestic controversy. Despite the Referendum outcome, Independence would have little legal impact on the Government's ability to act on the Group's Report because the relevant powers are already devolved, often for many years, and more are promised. However, politically, a nationalistic Scots government in the 2020s could - even within EU rules - move much further towards reducing the number and extent of large rural estates - with uncertain consequences for both the upland economy and its environment. "The Land of Scotland and the Common Good", Final Report of the Land Reform Review Group, May 2014. Available at http://www.scotland.gov.uk/About/Review/land-reform.